SpotWerkes Urethane Primer Surfacer is a two-component primer surfacer designed for spot and single panel repairs. MRS-8500 Primer Surfacer mixes 4:1 with MRS-8550 Activator and ready to sand in 20-25 minutes. It can be applied over polyester body filler, OEM surfaces, epoxy primer or self-etch primers, rigid and semi rigid plastics. 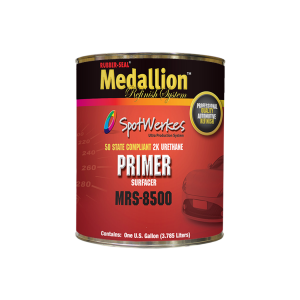 For optimum corrosion protection, a self-etch primer or epoxy primer should be applied to bare metal areas before applying MRS-8500. MRS-8500 can be reduced with MRS-8060 formulated with an accelerator or MRS-8085 formulated with a pot-life extender. It is V.O.C. compliant in North America. MRS-8500 is available in quarts and gallons only.